West Virginia is leaving the Big East Conference to join the Big 12. 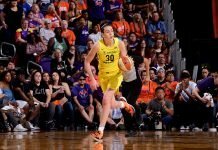 Phoenix Mercury legend-of-the-game Briget Pettis is retiring from the WNBA. The USA finished seventh in the Pan American Games with a convincing win earlier today over Jamaica, 87-41. Word on the final PAG showdowns coming soon.